HAVANA, May 28 (Reuters) - Red flags went up on beaches in western Cuban this week, closing them briefly to swimmers amid rumors that the BP oil spill in the U.S. part of the Gulf of Mexico was forcing sharks into Cuban waters. The government, through state-run press, quickly denounced the rumors as false and the beaches were reopened, but the incident reflected fears that the massive spill will reach Cuba and wreak havoc on an island still relatively untouched by modernity's environmental ills. 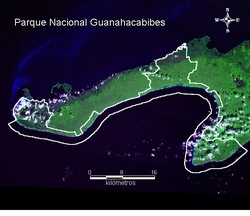 "Cuba, like all the countries in this area, is worried about the situation in the Gulf," said Osmani Borrego Fernandez, a director at the Guanahacabibes National Park at Cuba's western tip. So far, he said, there has been no evidence of the oil, but "we are alert." A trip along Cuba's coastline is like a trip back in time where vast stretches of palm-fringed beaches sit undeveloped and sea life abounds in the crystalline waters. While rampant development and overfishing have damaged coastlines and depleted seas around the world, communist-led Cuba has been largely preserved by its slow economic pace. As a result, scientists and environmentalists view Cuban waters as a place where they can see how the world's oceans were decades ago. "Many areas along the coast, and thousands of small keys, are in rural areas or are remote and have simply been left alone," said Dan Whittle, senior attorney at the Environmental Defense Fund. "Ernest Hemingway set up a fish camp on Cayo Paraiso (about 90 miles (145 km) west of Havana) in the 1940s and the area has not really changed since then. If he were still alive, he'd still recognize it today," he said of the U.S. writer who lived in Cuba for two decades. Cuba's northwest coast is considered most in danger from the oil. It is there that coral reefs, seagrass beds and mangroves provide major breeding grounds for many fish and sea creatures, including endangered migratory species like sea turtles, sharks and manatees, Whittle said. All that is at stake if the BP oil finds its way to Cuba. It could also damage Cuba's tourism industry, which is centered on beaches and to a lesser degree eco-tourism. Tourism brought in more than $2 billion to Cuba last year, or about 20 percent of Cuban's foreign exchange income. The good news for Cuba is that the spill is still centered about 300 miles (483 km) northwest of the island and BP may finally be gaining control over the massive leak. Officials for the oil giant said on Friday their so-called "top kill" solution of plugging the gusher by pumping in "drilling mud" was showing signs of success. But even if that happens soon, Cuban officials are concerned that the oil already in the water could be swept south by gulf currents. Cuba is separated from the Florida Keys by just 90 miles (145 km) of water and despite their disparate political histories, the United States and Cuba are inextricably linked ecologically. Another rumor that supposedly contributed to the Cuban beach closures this week was that lionfish, which have venomous spikes and have invaded Cuban waters in recent years from Florida, were poisoning swimmers. The government said that rumor also was false. The United States and Cuba have been at odds since Fidel Castro took power in a 1959 revolution, but they held talks last week about the oil slick, officials said. Cuba expert Wayne Smith at the Center for International Policy think tank in Washington said he met with Cuban authorities this week in Havana and that they are "fully open" to cooperation with the Americans to stop the oil. Standing in the way is the longstanding U.S. trade embargo against Cuba, which prevents the use of much U.S. technology in Cuba. At a conference this week in Washington, oil experts and environmentalists said it was time to allow cooperation with Cuba in oil safety practices. "We are not talking about a transfer of technology. All we are asking is that, if there is an accident, the Cubans can pick up the phone and call American experts who can bring resources within 24 hours," said oil expert Jorge Pinon. The issue is becoming a bigger one as Spanish oil giant Repsol (REP.MC) (REP.N) prepares to drill for oil off Cuba's ecologically rich northwest coast perhaps later this year. It has contracted for use of an Italian-owned drilling rig now being completed in China. While the spill is a disaster, it might have one positive result, Smith said. "It actually could help improve (U.S.-Cuba) relations if we cooperate in the right way and we have the right attitude," he said.